Serbia’s Jovana Jakšić was eight years old when a deep love for tennis took root. Faced with what ended up being a life-defining realization, she responded as any child would. She cried again at twelve, this time tears of determination. Now 21, Jakšić has rocketed up over 300 spots in the WTA Rankings since the beginning of 2013. She started small, cutting her teeth on the ITF Pro circuit. Where one traditionally thinks of a tennis player as a compulsive country-hopper, the Serb strategically settled where she could rack up wins and build her confidence, winning seven of her fourteen ITF singles titles in the resort city of Antalya. The Serbian No. 5 became equally comfortable at the WTA International event in Monterrey, Mexico. Fresh from a three week stint in Antalya – where she won two titles and 14 of 15 matches played – Jakšić qualified for the main draw in her WTA Tour debut in 2013, dancing into the second round after a 7-6 in the third win over former No. 31 Vera Dushevina. Though playing just one more WTA main draw that year, her strong results at ITF events – five titles in all – guaranteed a finish just inside the Top 150. Having begun the year ranked No. 420, Jakšić was pleased with her rapid rise, and eager for more success. Continuing her transition from the minor leagues this season, Jakšić played more than triple the number of WTA tournaments from the year before, but is quick to credit the ITF experience as crucial for her development as a player. Returning to the site of her big league breakthrough, Jakšić turned Monterrey upside-down in 2014. Knocking out No. 7 seed Karin Knapp – who had just pushed Maria Sharapova to the longest match of the season – the Serb kept on winning, knocking out a pair of qualifiers before earning a thrilling victory over veteran Kimiko Date-Krumm to reach her first WTA final. Across the net for the biggest match of her career was friend, compatriot, and No. 2 seed Ana Ivanovic. Jakšić found herself in the first all-Serbian final in WTA history, an achievement of which the World No. 115 is deservedly proud. Growing up at a time when players like Ivanovic, Jelena Jankovic, and Novak Djokovic were all making big waves in the sport, Jakšić believes the precedence of excellence set by her peers adds no extra pressure, and can only yield positive results. Following her runner-up performance in Mexico, Jakšić gained direct entry into her first two Grand Slam main draws. Losing a pair of three-setters to experienced players drove home just what is required of a WTA stalwart. Traveling with mother Danijela, who coaches her alongside childhood instructor Dean Dermanov, the WTA Rising Star has already attracted attention from some of the sharpest eyes in the sport. The Serb is represented by PR Manager Katie Spellman, who also works with Wimbledon champion Petra Kvitova, and was just signed by Agent Atleta Ltd. (located near her new Las Vegas training base) in October. Planning to give it all during the off-season, Jakšić aims to improve her serve and movement with one goal in mind: a Top 100 ranking. Off the court, Jakšić can be found online, replying to fans, posting pictures, and chronicling her busy life on Tour. 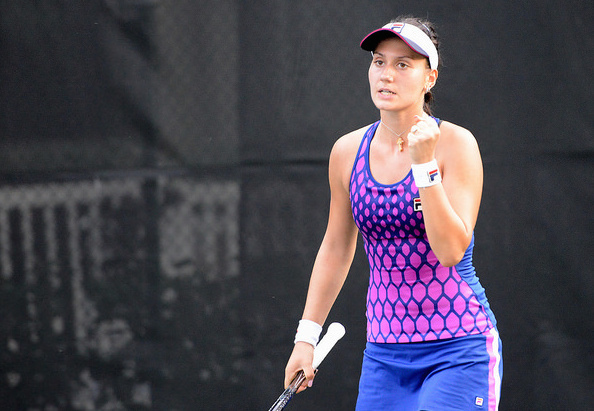 For all she has already achieved, Jovana Jakšić refuses to become jaded by the daily grind of the game, and retains that same childhood passion that brought her to tennis in the first place. Follow Jovana on Twitter @JaksicJovana!